Description: Wingspan 28-38mm. Forewings reddish brown with darker prominent veining and a small black discal mark. Hindwings pinkish red, suffused with grey near the outer margin. Thorax reddish brown and quite hairy. Abdomen red with a dark dorsal stripe. Flight Period: From mid-May until mid-June and again during August until early September. Status: Widely distributed but never abundant even at some of its well-known localities. It occurs frequently at some coastal sites and inland it is regularly seen at sites in north Armagh and in parts of Fermanagh. 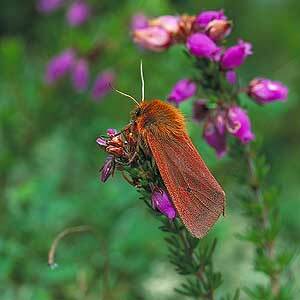 Ecology: A small, conspicuous moth mainly associated with coastal and inland heaths. Adults are said to fly occasionally in warm sunshine, which, probably accounts for some individuals that are occasionally met with during the day. It is however normally encountered at light in very small numbers. The larvae can be found from July until April of the following year on a variety of plants including Heather Calluna vulgaris, purple moor-grass Molinia caerulea and dock Rumex spp. It overwinters as a larva. World Distribution: A Holarctic species.